Mother’s Morning Out is a ministry to all parents and offers a ‘break’ during the week to run errands or just have some time for yourself! Join us for prayer, numbers, letters, arts & crafts, music and LOTS of play! The room is located just to the right of the church along the covered walkway to the back of the school and church offices. This is available for children ages 1 – 4 years old and meets on Tuesday and Thursday from 8:30 to 11:30 during the school year. 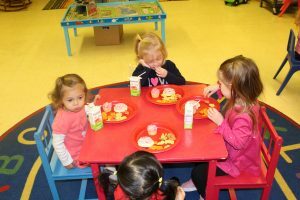 Lunch Bunch is offered from 11:30 – 2:30 p.m. each day. There is early drop available for all children from 8:00 to 8:30 a.m.
MMO starts August 7, 2018 for the 2018 – 2019 school year. Drop in rate is $20 for 8:30 A.M – 11:30 A.M. or $30 for 8:30 A.M. – 2:30 P.M. Please contact Rachael Kenyon for more information at 601.594.7427.